Use the Winco HRS-4 Stainless Steel 4-Piece Display Riser Set to add height and visibility to your buffet table. This riser set has four stands of different heights so you can situate them around the table or side by side for a layered look. It can also be positioned under a tablecloth to add a dramatic effect. 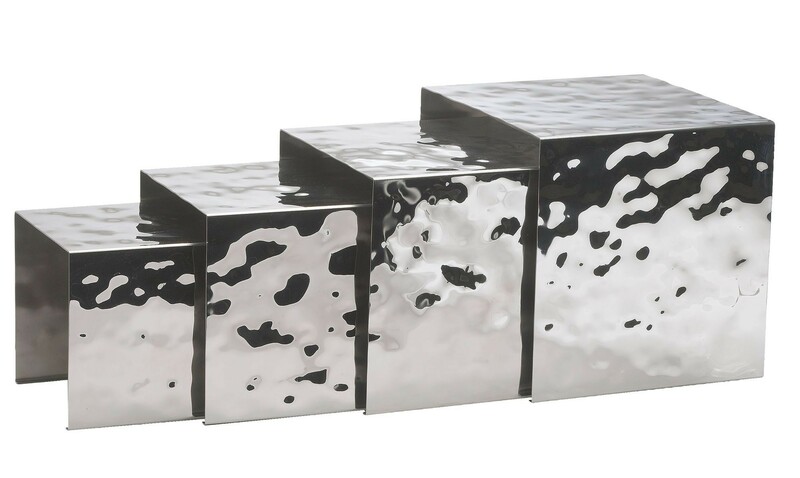 Crafted from 18/8 stainless steel, this set is non-corrosive and rust-resistant while its hammered design gives it a stylish touch. Perfect for use at restaurants, hotels and catered events, this riser set has a contemporary look and is strong enough to hold heavy weight without bending out of shape. Riser 1: 5-1/2" x 5-1/2" x 5-1/2"
Riser 2: 6-5/8" x 6-5/8" x 6-5/8"
Riser 3: 7-7/8" x 7-7/8" x 7-7/8"
Riser 4: 9" x 9" x 9"